Q1) An influential view of the current state of historical and literary scholarship pertaining to India is that of Sheldon (Shelly) Pollock, who remarks: 'the number of citizens capable of reading and understanding the texts and documents of the classical era—or precolonial or premodern or pre-1800 era, all equivalent terms for my purposes here—will very soon approach a statistical zero. India is about to become the only major world culture whose literary patrimony, and indeed history, are in the custodianship of scholars outside the country: in Berkeley, Chicago, and New York; Oxford, Paris, and Vienna. This would not be healthy either for India or for the rest of the world that cares about India.' Does this critique also apply to Maharashtra, and to what degree? A1) Shelly is one of the leading intellectual voices of the study of South Asia today and this statement reveals his deep investment in sustaining and expanding the study of South Asia, particularly of the philological study of South Asia. But this is not a specific statement; rather it is a general statement that highlights the fact that a genealogy of luminous philological scholars of Indian origin working and living in India appears to be tapering in the present, even while enormous amounts of money pour into Indian educational and cultural institutions, in part fueled by the opportunities afforded by economic liberalization. But it is also worth noting that the composition of the body of intellectuals and scholars in the position of being custodians of India's literary history outside India boasts a far greater percentage of South Asians--born in South Asia or one to two generations removed--then during the era of towering figures of Indian philology in India during the first three quarters of the 20th century. So the question is also one of the dislocation of intellectual and academic capital from its historical contexts within an era of globalized mobility, the shifting of resources to specific economic climates in a sense. There is also here a question of the general decline of philological scholarship (decline in number of practitioners, not in quality) worldwide, not just in India, but in the academies of the US and Europe that have also endured this decline. India's case of this particular disease is perhaps more severe, and Shelly is pointing this out. In Maharashtra, I find that philological scholarship continues, even if its conditions do not seem to improve with the rapidity of a special economic zone. In Pune, for example, Pune University has active philological scholars in several areas, from history to sociology to Sanskrit to Marathi studies. Several institutions carry on vital work and sustain the endeavors of committed philologists, such as the Bhandarkar Oriental Research Institute and the Bharatiya Samshodak Mandal, as well as activities at places like Deccan College. But Shelly may counter that this institutions may be stable, but they are not growing -- and this may be the case. I cannot really say. Outside of philology, I find that the field of history is strong and growing, and its subject matter is usually (though of course not always) within what Shelly identifies as the classical era (which in Maharashtra overlaps with the Maratha era, and the history of the Marathas is the key subject of Marathi historiography). But Shelly's statement is also specifically aimed at the institutionalization of philological scholarship. Maharashtra, like much of India, has a veritable parallel intellectual industry among hobbyists, auto-didacts, retired engineers and doctors, etc. The formalization of such studies, especially in academic or other formal environments, may be level or even declining (I trust Shelly's judgment on an all-India level), but in some cases the private pursuit of the classical is flourishing, just in contexts much harder to detect. Outside of academic contexts (which I think Shelly very specifically invokes here), there are of course many, many Maharashtrians who can read, recite, or have memorized, various bodies of literature of the "classical" in Marathi, particularly materials surrounding the "saint-poets" such as Jnandev, Namdev, Eknath, and Tukaram. But Shelly's point is somewhat different, and importantly so, though I think people within this category of the "devotee" should not be dismissed from the inventory of those who can engage with India's classical literatures. Q2) Give us a sense of what attracted you to Indian religion and what brings you so often to Maharashtra. A2) I first came to India simply out of curiosity. I wanted to go to the Soviet Union, but it had just become Russia, and fallen apart, so I chose a more stable democracy. I lived in India for a year when I was 20 years old. I could not distinguish the "religious" from everything else -- or rather the idea of the "religious" seemed inconsequential to me -- it was all culture I observed. But as I left undergraduate school and entered graduate school, I became indoctrinated into the regime of disciplines that organizes the academic business (and the publishing business? ), and of all of them, "religious studies" seemed the only one broad enough to show real longevity into the future for me. So while my interests ranged from ethnography to performance, from history to visual culture and film, I found the only discipline that would allow me to pursue any strand of interest I encountered was "religion." Now, however, I find myself very interest in "religion" specifically, and its relationship to history, both in terms of philosophy and disciplinary approach. In general, I'm wondering why and when historians stopped being philosophers of religion, even while religion remained a key theoretical problem in sociology, anthropology, psychoanalytical theory, feminism, Marxism, postmodernism, and so on. Now I return year after year to India to continue my studies, to renew my friendships, and in some sense to come "home" to a place in which I've spent half of my life and hope to spend the next half as well. Q3) What fascinated you so much about the history of Namdev that you undertook this project, and what were some of the difficulties you had to overcome while doing it? A3) I found Namdev fascinating because he was so ordinary, below the surface, unremarkable in a sense. He was overshadowed by Jnandev and Tukaram in the Varkari pantheon of sants. In northern India he was also collected within the panth or collection of songs and hagiographies dominated by another figure: the Kabir Panth, the Dadu Panth, Sikhism, etc. He was everywhere, but always secondary. And so I wanted to understand why he was remembered at all. What made him important? 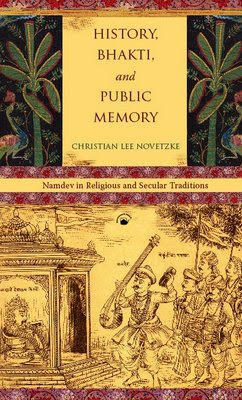 I wrote my book, History, Bhakti, and Public Memory, about this problem and determined that Namdev is a vehicle for remembrance of all sorts -- history, memory, cultural performance. Q4) Who are the major Marathi scholars you feel the English-speaking world doesn’t know about but should. A4) R.C. Dhere is a key figure, whose book on Vitthal is now in a beautiful translation by Anne Feldhaus. I think the work of Rajwade is essential. In my work on Namdev I have greatly enjoyed the writing of figures like Ashok Kamat, V.L. Manjul, S.B. Kulkarni, Kalyan Kale, Sadanand More and many others. Writing in English, the work of Dilip Chitre is enduring and luminous, as is the work of Raja Vora, who always seemed at the very center of everything. I have begun to read marvelous studies by Varsha Shirgaonkar as well. Q5) If you had to recommend five Marathi classics (fiction, non-fiction, poetry, any genre at all) to the non-Marathi world, which would these be and why? Mumbai, it’s a big town, a magnificent town! That the city unfolds like a rose flower. And the steamboats are something else altogether! There’s a fine habit of getting drunk! They gather and pound the door with their heads! Q6) Name six books OUTSIDE your disciplinary area that have meant a great deal to you in some deeply personal way, or constituted you in some defining way. Namdev is a central figure in the cultural history of India, especially within the field of bhakti. Born in the Marathi-speaking region of the Deccan in the late thirteenth century, Namdev is remembered as a simple, low-caste Hindu tailor whose innovative performances of devotional songs spread his fame widely. He is central to many religious traditions within Hinduism, as well as to Sikhism, and he is a key early literary figure in Maharashtra, northern India, and Punjab.